Intravenous glutathione is the term used for glutathione that is injected directly to the bloodstream of patients. It is also called injectable glutathione. I.V. glutathione therapy has been used in a variety of diseases such as Parkinson's Disease and cancer. It is also used for skin whitening. I.V. glutathione therapy is being used to treat Parkinson's Disease or PD. Parkinson's Disease is a progressive disorder that affects movement, muscle control, and balance. A popular study about its effect on the progression of PD was conducted in 1996 by a group of Italian scientists. In this study, nine patients with early, untreated Parkinson's Disease or PD were treated with glutathione intravenously, 600mg, twice daily, for 30 days. The drug was then discontinued.A follow-up examination were carried out every month for 2-4 months. The study concluded that all patients improved after the glutathione therapy. Disability of the 9 nine patients decreased significantly at 42%. The study indicated that there is a great promise for patients with untreated PD when glutathione is administered intravenously. In the Philippines, PD is not a common disease. It is not surprising therefore the intravenous glutathione is not used for PD, but for something else. You guessed it right! Skin whitening. Most people who buy oral glutathione get frustrated with the results. Most likely, they do not know that oral glutathione is useless since it is poorly absorbed by the body. The most effective way of raising glutatahione levels naturally is by taking in n-acetylcysteine along with other antioxidants such as Vit. C.
Intravenous glutathione is usually prepared by mixing the powder form of glutathione mixed in water. The powder form is usually lyophilized or freeze-dried glutathione sodium. The usual single dose used in skin whitening is 500mg-600mg glutathione to 4 ml water. The IV vial containing the glutathione powder and the 4ml saline water is usually sold in tandem by pharmaceutical companies. 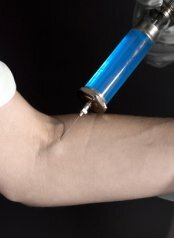 Only doctors and nurses who are trained to do intravenous injection are qualified to ingect IV glutathione to patients. Not surprisingly in the Philippines, people who want to have a fairer skin, take IV glutathione injections from various beauty and medical clinics. Some even buy their own injectables through agents and have a doctor or nurse administer them, to save on cost. In some websites, IV glutathione sell around $125- $150 per box of 10 vials. According to sellers of these GSH injectables, IV injections whould be done twice a week or every three days. So if you do the math,one injection costs around $15 plus doctor's free. Plus shipping costs, if applicable. If you do IV GSH twice a week for a month then you would likely spend around $150-$200 per month. There is a danger of buying fake glutathione injectables, though, especially if you buy it from a non-doctor. If you prefer to go to the beauty clinics or doctors, a single IV glutathione session costs around P 2,500 or approx $50. So, if you have 2 sessions per week for a month, you will spend around PhP 20,000 (approx $400). Just to have a fairer complexion. In these clinics, aestheticians will likely sell you some oral glutathione pills too! They probably want to make sure you do get whiter skin. And it won't hurt to increase their sales! As a powerful antioxidant, glutathione is also used to treat cancer in addition to therapies. GSH in IV form, particulary, is used because of its effective delivery of glutathione to the cells of the body. Glutathione therapy for cancer is not a routine treatment unlike chemotherapy and radiation therapies. It is an alternative medicine therapy, usually used by people who dislike the traditional treatments. Or, it by patients who are not satisfied with the results of the traditional treatments. In the Philippines, there is a center, the EIC Therapy Center, that uses i.v. glutathione as one treatment to cancer. The center uses traditional and alternative medicine to fight cancer cells and restore the body's natural state. I personally believe in non-invasive and alternative medicine treatments. And treatment of cancer is no exception. Intravenous glutathione is an experimental therapy to Parkinson's Disease in the U.S. In the Philippines, it is unheard of. IV glutathione in the Philippines is mainly used as skin whitening agent. It is also used by a few doctors to treat cancer.